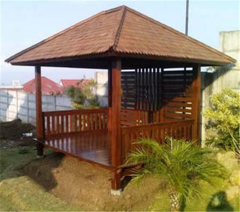 Furnisindo is furniture manufacturer and exporter from Surakarta - Central Java that supplies many furniture products and the buying agent for handycraft , such as; garden furniture, bamboo furniture, wooden furniture, handicraft, shell crafts, gifts, house wares, etc. This furniture manufacturer has exported its products to many countries and help all importer to supply their furniture needs. Furnisindo is also can help locate the appropriate manufacturer for wide ranges of products. All products of furnisindo furniture are made from selected wood and finished by experienced craftsmen. The furniture products are divided into some models, such as; UFO, Dayana, Ramona, Bilia, Alice, Philippo, gazebo, wooden house, and so on. All products are made from wooden material.